Hello too, by the way! There have been many times where I briefly considered doing a post, but it all seemed too hard, as there are so many pictures I haven't posted. Was just thinking that a few minutes ago and realised that the number will only keep rising, so I might as well. Therefore, below you will find an assortment of pictures, totally random, as I mostly do my crafting by mood or need - need a card or have an order? Well, that equals instantaneous create mode.... Nothing particularly needed... that one equals create by mood mode... lets get to it! What will I find? ...hmmmmmm... Well, it turns out that I do have a few photos on my phone that I haven't protected with Gimp2 yet so I can't upload them here. But I did find my very latest colouring projects. The challenge was for an 'online bridal shower' for our Colouring Queen: Alyce Keegan, from Kit and Clowder (where I am taking my colouring classes - when I get around to doing them). This image was provided to us for free by one of our members and we had to colour it in sepia tones. 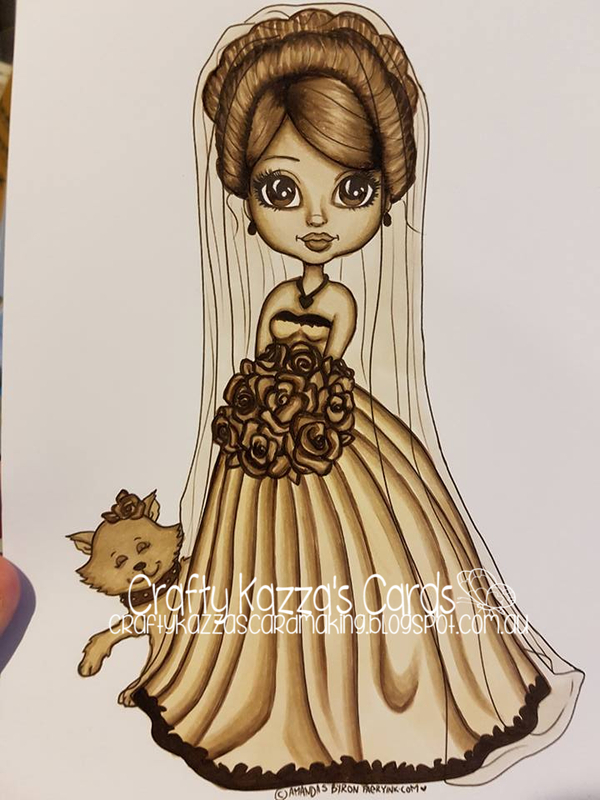 This first bride I used 6 colours of copics - all Earth tones. 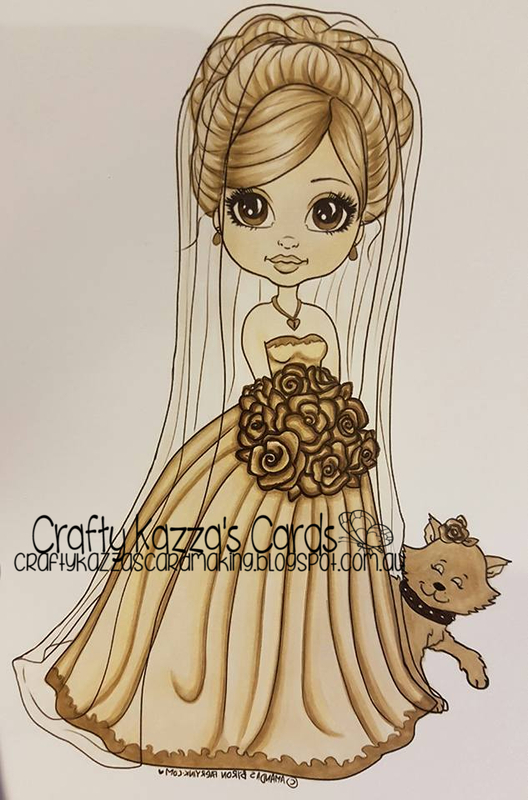 I was not game to use the really dark colours in really more than her eyes, flowers and the cat's colour. Nevertheless, I was quite blown away with how she turned out. I was thinking of going over her more with the darker colours but decided to leave her alone in case I stuffed her up and also because I'd printed two images so I had a backup I could practice darker colouring on anyway. For my second bride, I used exactly the same colours but more of the darker ones. Viola - she's gorgeous - even if I do say so myself. I love how she turned out, even though I don't really understand how to colour in folds, they look bloody good I think. (I have the skin and hair and clothing classes - I haven't made any time to look at them yet. I'm also behind on my monthly colouring classes. The August class - I did that one twice. But I'm yet to do the previous two months classes and also now have the September class to do. Another will arrive on the 15 of October (and monthly thereafter). Well, I think that's about all I've got ready for posting for now. Thanks for looking and commenting for those that do. More will be forthcoming.... eventually. As I've told you Karen, both utterly gorgeous!! Karen your colouring is excellent they are both beautiful! !